Japan’s classical tradition underpinned almost every area of cultural production throughout the early modern or Edo period (1615–1868). 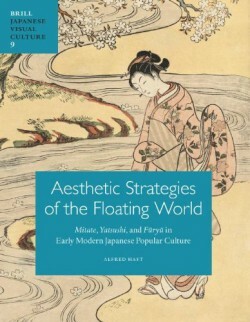 This book offers the first in-depth account of three aesthetic strategies—unexpected juxtaposition (mitate), casual adaptation (yatsushi) and modern standards of style (fūryu)—that shaped the way Edo popular culture and particularly the Floating World absorbed and responded to this force of cultural authority. Combining visual, documentary and literary evidence, Alfred Haft here explores why the three strategies were central to the life of the Floating World, how they expanded the conceptual range of the popular woodblock print (ukiyo-e), and what they reveal about the role of humor in the Floating World’s relationship with established society. Through a critical analysis of prints by major artists such as Harunobu, Koryūsai, Utamaro, Eishi and Hiroshige, Aesthetic Strategies of the Floating World shows how the strategies made ukiyo-e not merely the by-product of a demimonde, but an agent in the social and cultural politics of their time.